From The Joseph's Studio Renaissance Collection by Roman, Inc., this Low Relief Last Supper Wall Plaque is a beautiful depiction of our Lord's Last Supper with the Apostles. The Apostles are seated to the left and right of Jesus......a colorful, yet moving piece. 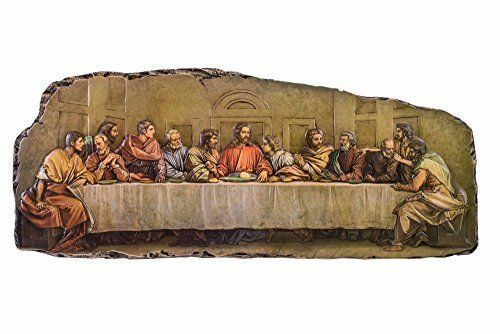 The Joseph's Studio Last Supper Wall Plaque is made of a low relief resin/stone mix with protected decal and measures 7.25” high x 17-½” wide, with two key hole hangers on the back. This Last Supper plaque comes in a gift box. This Joseph's Studio Lord's Supper wall plaque is masterfully painted in rich colors with detailed, expressive faces. Dimentions: 17.5" x 7.25" x 0.4"